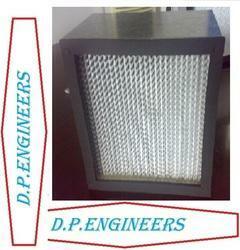 These Filters are HEPA filters certified to be a minimum of 99.97%, 99.99%, or 99.999% on 0.3μm per Mil. Standard 282. Ultra seal filters are available in a variety of framing materials, galvanized steel, aluminum, stainless steel, and particleboard. Frame types include DTF (double turned flange), single and double-header, box, groove seal, reverse groove seal, and C-style in metal. In wood, frame styles include box, groove seal, single and double-header. Three flow rates are available to meet varying fan capacities, Standard, Low Resistance, and High Capacity The standard models can be utilized up to 220ºF (104ºC), and 100% RH. A High Temperature version is available for temperatures up to 500 ºF (260ºC) for prices call our toll free number. 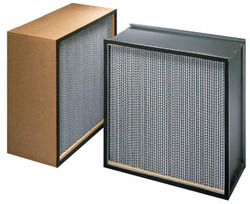 HEPA Filters are designed to meet the critical filtration requirements where airborne contaminants can cause damage in manufacturing processes, equipment, or may cause health hazards. Only materials that meet our stringent quality standards are utilized. All manufacturing steps are closely monitored to insure that every filter will perform as expected. These filters have an efficiency of 99. 97% down to 0. 3 micron of dop aerosol. 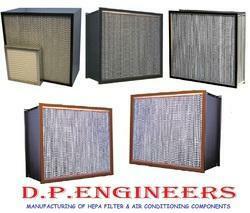 We manufacture and supply a wide range of Industrial HEPA Filters which has high filtration efficiency. These are manufactured by hemmed edges of aluminum separators in order to provide rigidity & uniform air flow. We do quality analysis and testing of these Industrial HEPA Filtersbefore we handover this to our valuable clients. We have specialized team of experts who do quality checking under certain parameters that meets international standards. HEPA filter are widely used in pharmaceutical,Clean room,Semi-conductor,Biotechnology,Photo film,Optical,Precision mechanical,Critical o.T,Defense,Air handling units etc. efficiency 99. 997 % down to .3µ. 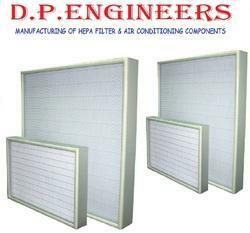 Hepa filters are manufactured with imported submicronic glass fiber media of 0.3 microns and above filtrations. In the normal design the glass fiber media is formed in to accordion pleats separated with aluminium separators and then sealed into the frame with suitable non dissolving adhesives. These filters are designed to give an efficiency of more than 99.97 % down to 0.3 microns with an initial pressure drop of less than 25 mmwg. Standard sizes available are. Absolute Compact Filters are designed for use in HVAC/Industrial Applications requiring cleaner air but where HEPA Filtered air is not required. 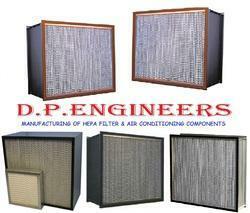 These filters are also known as Efficiency Particulate Air Filter (EPA). Air filtration of 0.3µ to 1µ w particles. Secondary filtration for in Critical Clean room Industry Such as Vaccine, Production Work, Injection filling Work etc. Final filtration in Minor 0.T S & in-patient-care, Photo Film Industry. CASING CONSTRUCTION :Galvanized steel / CRCA powder coated /Aluminium anodized/SS 304. Deep Pleat HEPA FiltersBeing a client centric organization, we are involved in manufacturing and supplying a wide range of deep pleat hepa filters. 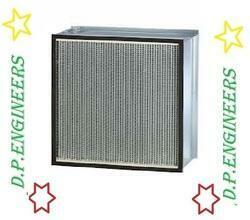 These specially designed and developed filters are available in various dimensions and technical specifications. Entire range of our deep pleat hepa filters is made under the firm direction of quality controllers, who ensure us for the delivery of 100% defect free range at our clients’ end. 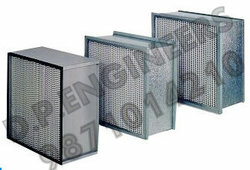 Application : These filters are used for Nuclear Installation Clean – Room Systems. Pharmaceutical industry, Laminar Flow Working Bench, Hospital Sterile areas, Space application Food processing zone, Biological Centre and many More. Efficiency : 99. 997 % to particle size of 0.3 microns. Velocity 1.2 to 1.5 M / sec. Reasons of areas with an important need for eliminating submicron particles could be bomb shelters gas masks, optic and precision mechanical production, sensitive electronic components computer, nuclear installation clean room systems pharmaceutical industry laminar flow working bench, hospital sterile areas, space application food processing zones, biological centre and many more. Air filters with an extremely high collecting efficiency were required for above specific areas. 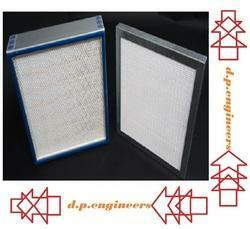 The Absolute (HEPA) Filter consist of frame in which the media is inserted is highly folded form. The filers are held open by corrugated separators. The media is produced from highly waler repellent and temperature resistant 100% microglass, High Strength fiber paper. The folded configuration provides an exceptionally large filtering area in proportion to the face area of the filter.Separator design that provides significant advantage controlled media sparing for virtually no turbulence low friction uniform velocity, uniform dust holding optimum filter performance. The air velocity through the media is very low, normally about 2-2.5 cm/sec. The separators are safe edge tapered aluminum or plastic. The absolutes are supplied as standard with gasket of either closed cell neoprene are if desired and at on extra charge with silicon gasket. The gaskets are provided at air entry side and air exit side. The Sealer between the filter media and the frame is of neoprene rubber base silicone glue, urethane compound or ceramics according to the temperature requirements. Absolute filters are available with same of extruded aluminum untreated or stainless sheeting for special application. HEPA Panel Filter are widely used in pharmaceutical,Clean room,Semi-conductor,Biotechnology,Photo film,Optical,Precision mechanical,Critical o.T,Defense,Air handling units etc. 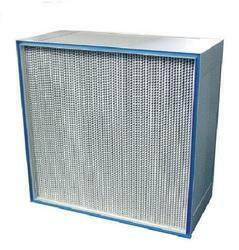 HEPA Panel Filter are manufactured with imported submicronic glass fiber media of 0.3 microns and above filtrations. In the normal design the glass fiber media is formed in to accordion pleats separated with aluminium separators and then sealed into the frame with suitable non dissolving adhesives. These filters are designed to give an efficiency of more than 99.97 % down to 0.3 microns with an initial pressure drop of less than 25 mmwg. Standard sizes available are.